Chaplin died early in the morning on Christmas day in 1977. This is the restored version of the original 1925 silent film with intertitles. It is a masterpiece and was Chaplin’s favorite among his films. The film touches on strong childhood feelings in me. 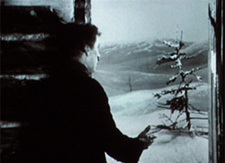 Except for the opening sequence of the hundreds of men climbing the snow covered pass, and a bit later of Chaplin sliding down a mountainside, the film was shot almost entirely on Chaplin’s sets, as he preferred to work. For me, this 1925 film is unrivaled (among all films I know) in its poetic, evocative, convincing and seamlessly integrated sets and special effects. This film, included in The Chaplin Collection, Volume 1 , is a brief introduction to The Gold Rush . David Robinson is Chaplin’s biographer. Robinson mentions how when The Gold Rush first played the cinemas, the famous “dancing rolls” scene was so popular among many audiences that some projectionists were compelled to stop the film and rewind it to the beginning of the scene in order to play it again as an encore. What always stands out for me when I see this film is how Chaplin, in Hollywood in the late 1930s, was so aware of the conditions in Germany under the Third Reich. Aware of the terrible persecution, intimidation and the presentiment of genocide (Herring, the Göring in the film, mentioned to Adenoid Hynkel that they had developed a gas which can kill lots and lots of people.). Chaplin had access to enough information to make this powerful film, while many major U.S. companies were investing heavily in the Third Reich and the U.S. stood by and watched it all develop (no, it wasn’t entirely because of the isolationist sentiments of the population — that would never stop the U.S. from carrying out wars in its own interest.). Seeing this film has always felt like a ray of sunlight burning through the moral fog of U.S. involvement in World War II. I was raised on the myth of the U.S. holding the high moral ground in this era, when in fact it was other countries, mostly the Soviet Union, — not to mention the Resistance in Europe and the victims within the Third Reich: the socialists, communists, handicapped, Jews, homosexuals — who took the brunt of Nazi aggression and is where the heroes can be found. The U.S. could move into the void of a disintegrating British colonialism and set a boundary of contention for the coming cold war with a battered Soviet Union. I just realized as I finished this viewing of the film today, November 9th, the anniversary of Kristallnacht... while the U.S. continues terrorizing and killing the people of Iraq, mostly children, with a new fervor and bluster flowing from the intoxication of its new “mandate” which they would now shove down the throats of not only the Americans but of the rest of the world.